LAWRENCE – A team of University of Kansas School of Law students will compete in the finals of the National Transactional LawMeet this month after winning the regional round in Kansas City. The law school sent three teams to the regional competitions, which offer a “moot court” experience for students with aspirations to practice transactional law. Jake Ediger of Topeka, Justine Koehle of Woodland, California, and Alison Kryzer of Wichita were named finalists in Kansas City, Missouri. Craig Boyd of Dallas, Elizabeth Hanus of Elm Grove, Wisconsin, and Taylor Ray of Atchison were named regional semifinalists in Dallas, where they also won the prize for best draft agreement. Teams were assigned to represent either the buyers or sellers of a business. Over the course of two months, they drafted a purchase agreement, interviewed their clients and marked up opposing teams’ drafts. Last Friday, 84 teams met at seven regional sites to negotiate a resolution. Two teams from each region were selected to compete in the national rounds on March 31 in New York. Competition judges included partners from leading law firms, corporate general counsels and other senior practitioners. They chose finalists after evaluating which teams most adeptly combine their lawyering skills, drafting, marking-up and negotiating techniques with their knowledge of corporate and other facets of business law and business sense to develop innovative solutions to negotiate a draft agreement. For its Kansas City victory, KU competed with teams from Baylor, Emory, Northwestern, Notre Dame, William & Mary and Missouri. In Dallas, competitors included Baylor, Duke, Colorado, Georgia, Texas and Tennessee. With a winning team, a runner-up team and an award for best draft, KU tied for second place in regional round performance. Centennial Teaching Professor Webb Hecker and KU law alumni and adjunct professors Ken Lynn, Class of 1981, and Kelley Sears, Class of 1974, coached the teams in preparation for the competition. Three practicing attorneys also provided expert feedback: Jeb Bayer, Class of 1980, Brian Wolf, Class of 2008, and Stan Woodworth, Class of 1978. PHOTOS: Top: Jake Ediger, Justine Koehle and Alison Kryzer, pictured with Professor Webb Hecker, were named regional finalists in Kansas City, Missouri. 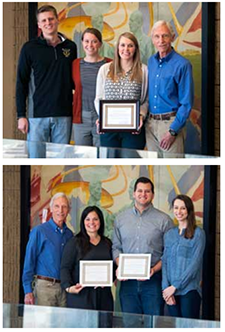 Bottom: Elizabeth Hanus, Craig Boyd and Taylor Ray, also pictured with Hecker, were named regional semifinalists in Dallas, where they also won the prize for best draft agreement.